Flan is the Spanish name for vanilla egg custard topped with caramel sauce. It is a classic in Spanish cuisine and one of the most popular desserts. You can find it served everywhere in Spain and it's not as difficult to make at home as you may think. Flan makes a great finish to any meal because, even though it is sweet, it's also a light dessert. You can also make a lower calorie flan by substituting the whipping cream with 1 cup non-fat milk and 1 cup light whipping cream. Flan can be an intimidating dish, but it doesn't have to be. When you break the classic flan recipe down into simple steps, you'll find that it's rather simple. Wipe out the ramekins to ensure that there is no dust in them. Set them in a 9- by 13-inch glass baking dish, which will be used for a boiling water bath while baking. Heat 4 to 5 cups of water in a pot on the stove. Heat a heavy skillet or saucepan over medium heat for 30 seconds. Add 1/2 cup sugar. With the back of a wooden spoon, keep the sugar moving constantly in the skillet until the sugar is completely melted and caramelized to a rich medium-brown color. Carefully spoon caramelized sugar into each of the 6 ramekins or a large baking dish. Preheat oven to 325 F (162 C). In a saucepan, scald the cream. Keep a close eye on the pan, so the cream does not boil over. Remove immediately. Meanwhile, in a mixing bowl, slightly beat 3 eggs. Mix in 1/4 cup sugar. Stirring constantly, gradually add the hot cream to the egg mixture. Stir until the sugar is dissolved and then blend in the vanilla extract. Ladle the mixture into ramekins. Carefully remove 1 or 2 ramekins to provide some extra room in the larger dish. Pour hot water until there is about 1/2-inch of water in the 9- by 13-inch baking dish for the water bath. Replace ramekins. If the water level does not reach 3/4 of the way up the sides of the ramekins, carefully add more water. Bake uncovered in the water bath for 50 to 60 minutes, or until a knife comes out clean when inserted halfway between the center and the edge of the dish. To ensure the custard does not over-cook, check for doneness after 45 minutes, then every 3 to 5 minutes. Carefully remove each ramekin from the water bath. Set on a cooling rack until lukewarm, then chill thoroughly in the refrigerator. This usually takes at least 1 hour. When ready to serve, un-mold the flan by running a knife around the inside edge of each baking dish. Place a small dessert plate on the top of the ramekin. With one hand under the ramekin and the other on top of the plate, turn it over in one smooth motion. Tap the ramekin and the flan should drop onto the plate. If it does not, carefully “prod” the flan out of the ramekin with a small paring knife. It should slide out and onto the plate. Garnish with whole blanched almonds and a sprig of mint if desired. 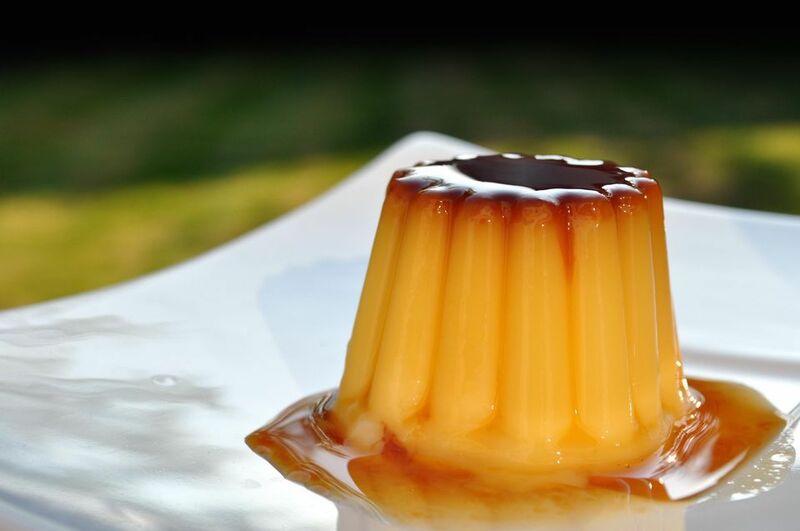 While it's traditional to bake flan in ramekins for individual servings, don't worry if you don't have them. A single baking dish that can fit into a 9- by 13-inch dish will work just fine. You do need to ensure that the dish holding your flan is tall enough to accommodate the 1/2-inch of water required for the water bath. Because it is made in ramekins or a baking dish and not removed until it's time to eat, flan travels well in an ice chest. This makes it an excellent choice if you need to take it to a dinner party or family gathering. Just cover it tightly with plastic wrap while en route and un-mold when ready to serve.